A popular leaf vegetable in Japan, usually used for hot pots and sukiyaki, it can also be eaten raw in a salad. With a mild taste and a hint of Chrysanthemum scent, it is a winter delicacy (although available nowadays all year round). Full of Caroten, Vitamin B2, C, E and Calcium, Iron, it is also known to prevent colds in the winter months. Wrap it in a damp newspaper and keep in the refrigerator for 2 days. 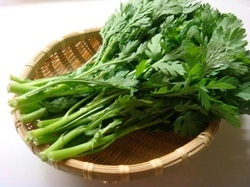 To revive wilting shungiku, chop off the end and place it a jug of warm water (up to 50 degrees C ) . Cut the leaves 3-4 cm in length. 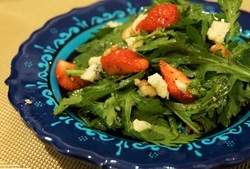 Use only the leaves as the stems are tough to eat raw. Cut off the stem from the strawberries and quarter it. Mix 2 Tbsp vegetable oil, 1 Tbsp sugar, 1 Tbsp vinegar, 1 Tsp blue poppy seeds, 1/2 Tsp sesame seeds, dash Worcestershire sauce, pinch of paprika in a bowl and whisk until well blended. Toss 1, 2, and 3 together and top with chopped walnuts and blue cheese or feta cheese.